First details about the Samsung Gear A, revealed! You are here: GeekSays Technology News » Smartwatch News » Samsung Gear » First details about the Samsung Gear A, revealed! Currently, almost all important players from the smartwatch market have a round model in their portfolio, except Samsung, which, as far as we know, has launched the most wearables until now. Still, this is about to change soon, as the Samsung Gear A, their highly rumored round smartwatch is getting closer with each day. Samsung’s first round smartwatch, coming this August? According to the folks over Sammobile, this could be the third device launched during the Unpacked event, from August 13, where the Galaxy Note 5 and the Galaxy S6 edge Plus are also expected to make their debut. Besides the round form factor, the Samsung Gear A, will feature a rotating bezel ring, which will be used to control the smartwatch. And the latter was confirmed by the manufacturer itself, so we can’t say more than we’re very curious to see how this system will actually work. 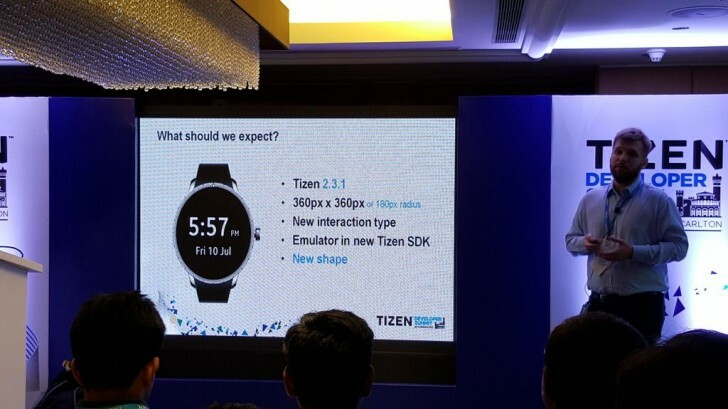 The rest of the specs were confirmed today, during the Tizen Developer Summit, held in India. To be more specific, the Samsung Gear A’s round display will have a resolution of 360 x 360 pixels and will run the manufacturer’s own operating system for wearables, Tizen 2.3.1. The smartwatch will be powered by an Exynos 3472 chipset, with two cores, alongside 768 MB of RAM and a storage capacity of 4 GB. The battery will have a capacity of 250 mAh and it should keep this little guy powered on for a full day of intensive use. Finally, the spec sheet is completed by Bluetooth 4.1 connectivity and Wi-Fi 802.11n, alongside a full range of sensors, like heart rate monitor, gyroscope, barometer and a GPS. Currently, there aren’t any details about the price of the Samsung Gear A, but we guess it should be somewhere around $250. At least that’s how much they should ask for it, in order to maintain it in the ‘affordable area’. Would you buy this smartwatch?